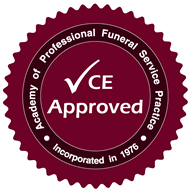 Funeral Directors and Embalmers in Indiana are required to complete 10 hours of continuing education every 2 years. The deadline is December 31st of even years. NOTE: Only 5 hours (50%) of the total CE requirement may be obtained from online or home study courses. The following courses are approved by the Indiana State Board of Funeral and Cemetery Service.